We had a great service project a while back. We did an activity with youth and wanted to serve the military. I happened to have a cousin serving over in Iraq, so with internet help (what did we ever do without the internet? 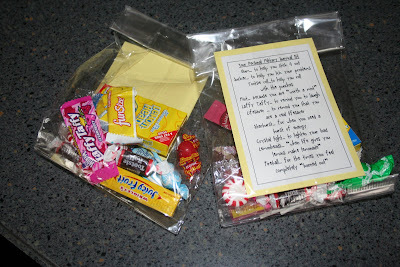 ), I came up with a very fun survival kit and we packaged up 16 of them to be distributed to whomever my cousin thought could use a pick-me-up. The funny thing about it is that it was all candy and my cousin was in the medical troop as a dentist! The youth had a lot of fun putting the kits together and writing letters to unknown servicemen. We talked about what these men and women are doing for our country and I was very pleased with the compassion the teenagers showed and how sincerely grateful they seemed. I am very happy that we were able to give them a chance to see beyond their lives and sheltered community to see what a blessing it is to have freedom. Mint... because you are "worth a mint"
Lemonheads... "when life gives you lemons make lemonade"